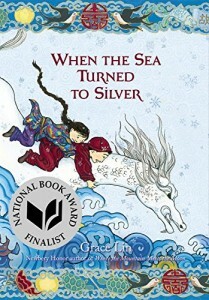 This third children’s book by Grace Lin, like the two previous ones, weaves classical Chinese tales into an adventurous tale of its own. The enchantment of the adventure is made richer by the classical stories, and vice-versa; the classical tales are given new meaning as they are told in the context of a story. In this case, the story is also about the storyteller herself, and the importance of stories. Because each chapter usually contains one classical story, I could see this children’s book used as an extended bedtime book, where each night only one chapter is read. However, be forewarned that these are not nice, sweet, fairytales, but are often about challenging and very difficult episodes involving good and evil. Compared to the other two books of this genre, this one feels a tiny bit darker, because of the presence of a malevolent emperor. However, for children with a strong constitution, this is nothing compared to digesting a Harry Potter children’s book. Most importantly, Grace Lin is masterful at creating characters that have important qualities. In this case, we watch the courage of the young girl maturing into a storyteller, finding her voice, and never giving up. As one of the characters says, “Storytellers can make time disappear…” and with this wonderful children’s book, the readers can lose themselves in a magical past.